Keeping your equipment properly calibrated is vital to the accuracy of testing and monitoring. The accuracy of your equipment is of the utmost importance to your business, and that makes it equally important to us here at Calibration Lab. For more than 10 years, we have helped businesses in an array of industries keep their equipment performing optimally. As specialists in the calibration & repair of equipment used for electrical testing and measurement, we take our responsibility to our clients seriously. Our commitment to providing a top quality service has made us the provider of choice for many companies throughout Ireland. With our in-house laboratory, we offer accredited calibration and repair solutions for all makes and models of electrical test and measurement equipment including Electrical Instruments, Temperature Equipment, Pressure Equipment, Torque Equipment, Substation / High Voltage Calibration, PAT Tester Calibration and Gas Detection Equipment. CalbirationLab operates as a division of Powerpoint Engineering Ltd. and provides calibration and repair services for electrical instruments, pressure and temperature equipment, PAT testers, gas detection equipment, torque equipment, high voltage and substation equipment. Our highly experienced technicans calibrate equipment of most makes and models. 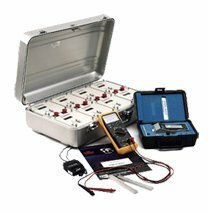 We have significant experience calibrating and repairing equipment from the most trusted names in the industry like Fluke, Megger, Robin and Seaward. At CalibrationLab, we understand the importance of getting the job done right the first time. Using state-of-the-art equipment, we take the time needed to correctly calibrate electrical test equipment and use quality checks to ensure that when we are finished, the equipment is providing 100 per cent accurate readings. Our dedication to accuracy makes us a company you can trust your most important equipment to with absolute confidence. While calibration is essential to the continued reliable operation of your electrical test and measuring equipment, you can’t afford to halt operations for weeks in order to have necessary service performed. That’s why CalibrationLab is committed to providing the fastest possible turnaround times to all of our clients. Typically, we can complete electrical test and measurement equipment calibration services in 5 working days. Choosing us means less downtime without sacrificing the quality of service. With competitive rates, fast service and an unfaltering commitment to customer satisfaction, CalibrationLab is the leading provider of calibration & repair service in Ireland. Check out our dedicated website www.calibrationlab.ie for more information about our services or phone us today on 057 866 2162.